OWC this week began to ship its ThunderBlade external SSDs with a Thunderbolt 3 interface. The new DAS can deliver up to 2800 MB/s read speeds, which is beyond what even USB 3.1 Gen 2 can offer and is designed to play into the bandwidth advantages of TB3. Meanwhile, two ThunderBlades can be run in OWC’s proprietary SoftRAID mode to take a full advantage of the TB3 bus at up to 3800 MB/s. OWC’s ThunderBlade DAS devices are available in 1 TB, 2 TB, 4 TB and 8 TB configurations. 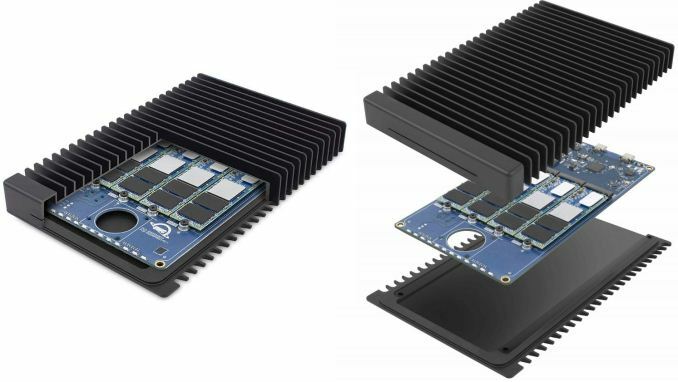 Based on the images that OWC demonstrates, all the models are based on four Mercury M.2 SSDs (Silicon Motion SM2260, LDPC, 3D MLC NAND) working in concert (think software-based RAID, but this is not something that OWC confirms). The manufacturer specs its ThunderBlade storage devices for up to 2800 MB/s sequential read speed as well as up to 2450 MB/s sequential write speed, which must be sustained speeds. Customers who need additional capacity can daisy chain up to six ThunderBlade DAS devices to get up to 48 TB of solid-state storage, whereas clients who need extra performance can run two ThunderBlades in the SoftRAID mode (once deployed for particular drives, they can be used on all types of PCs no matter which OS they use) to get up to 3800 MB/s transfer speeds. Keep in mind though that to get maximum throughput, one needs to connect the drives to ports featuring full TB3 bandwidth (i.e., don't connect them to the right-hand TB3 ports of 13-inch MBPs as they have reduced PCIe bandwidth, which is what OWC does on the picture below). 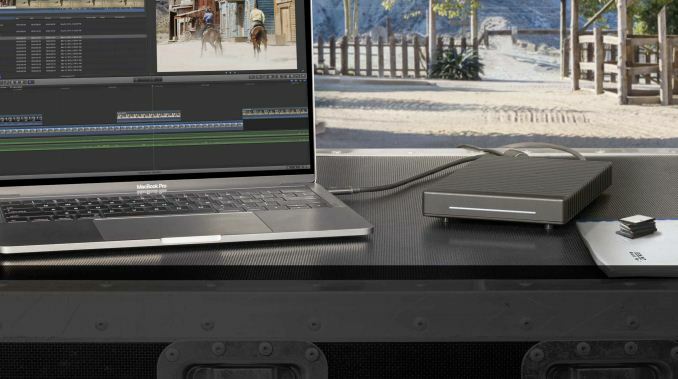 Since relatively portable DAS are usually transported with high-performance laptops to shooting locations, the OWC ThunderBlade drives come in a rugged enclosure made of metal that also acts like a cooling system for the NVMe SSDs. The new DAS are designed for customers working on Ultra HD video and/or VR content and who need external storage devices with extreme speeds as well as enhanced reliability. Therefore, prices of the drives are fairly high. OWC’s ThunderBlade are available from the manufacturer at MSRPs from $1,199 to $4,999. Thanks for this awesome informative article..